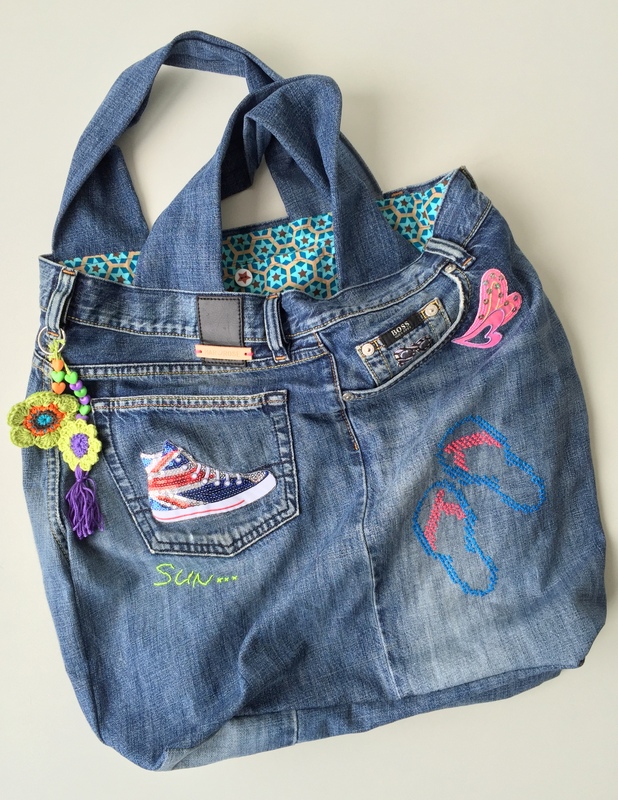 Much to my sweet husband’s surprise, I used an old pair of jeans of his to make this fun (beach) bag, that – believe it or not – holds all the stuff you’ll be needing for a day at the beach! Here’s how I did it. 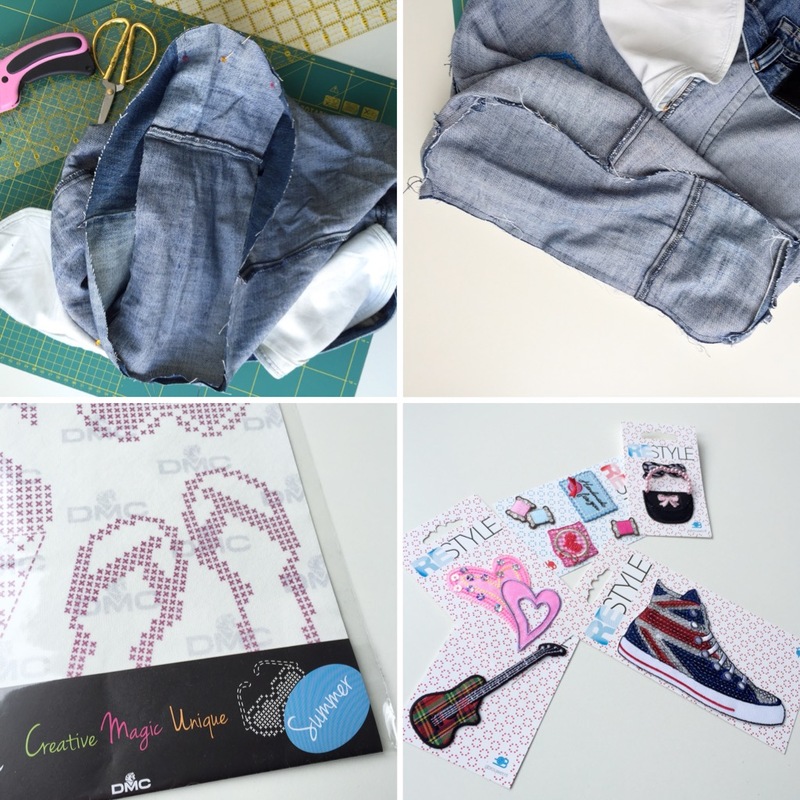 – sewing machine, needle&thread, pins, scissors and/or rotary cutter and mat. Put the pair of jeans down, side seams touching, with the back-middle seam pointing out to one side (photo top right).Cut off the pointiest part (see photo top right ↑). 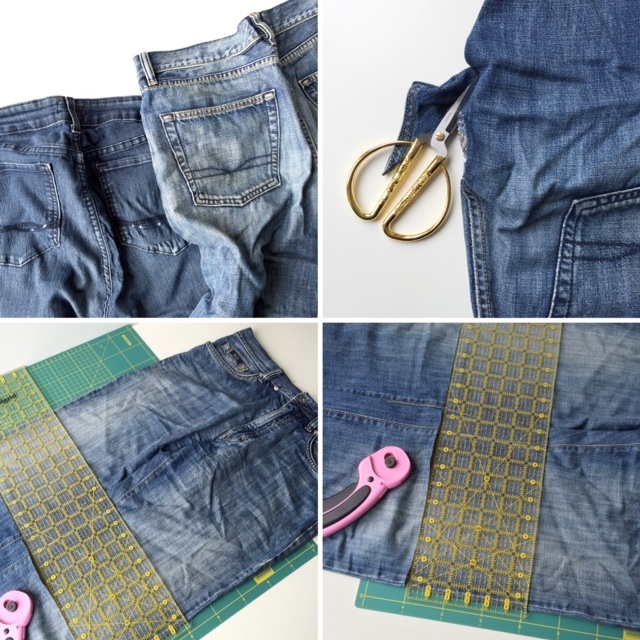 Now put the jeans on your rotary mat, flat-down, as shown in the photo bottom left ↑. This is where you decide how big/long you want your bag to be. Cut the legs off, but don’t throw them out – we’ll use them for both the bottom of the bag, as well as for the bag handles. Cut away all side seams of the cut-off leg parts (so you’ll have 4 pieces); from one of these, you’ll now cut out the bottom of the bag, in my case a piece of fabric measuring: 18 cm x 35 cm (approx 8 x 14 inches). Using two other leg-parts, you’ll prepare the two handles; fold each part in two, right rides together, sew the seams, turn them inside out: bag handles are ready. 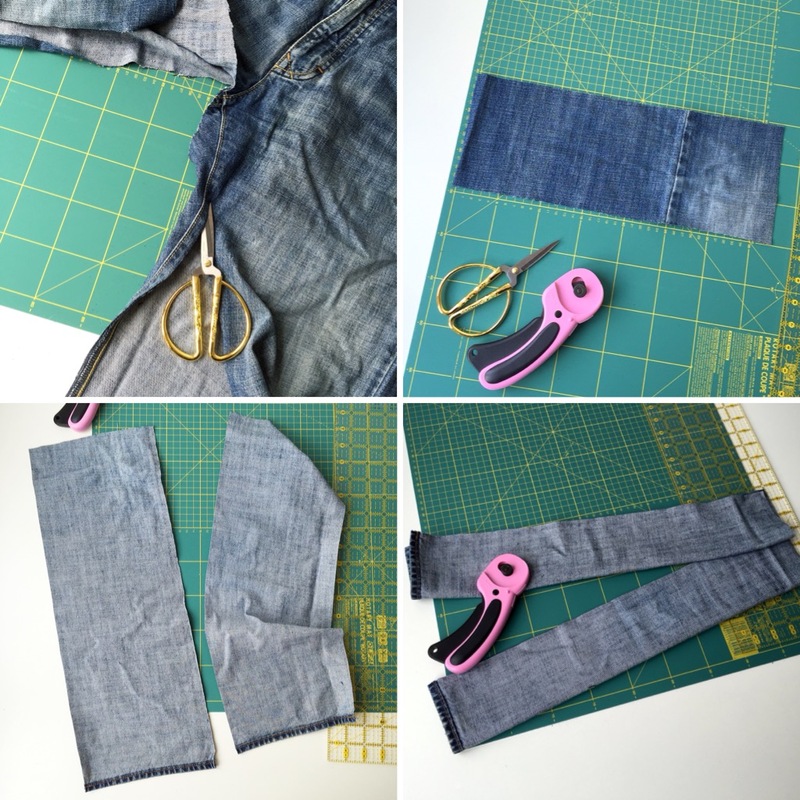 At this point you’ll fold the top part of the jeans – the actual bag-to-be – in such a way that the zipper is your left seam (is on your left side). 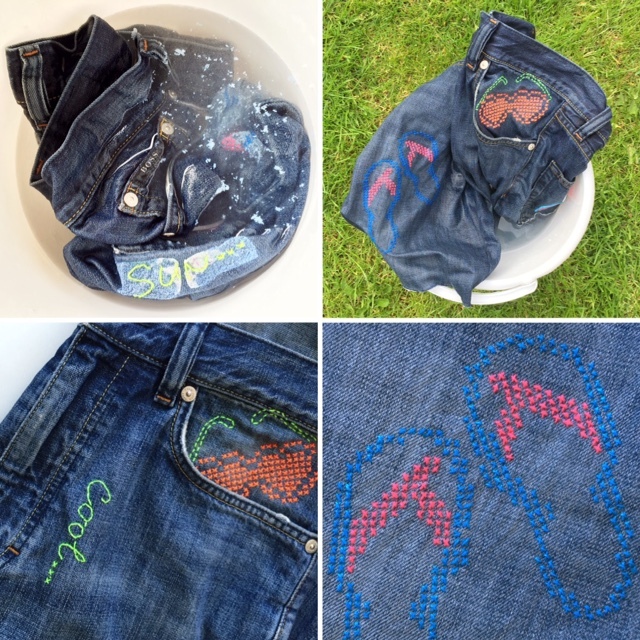 Line the top parts – front and back – of the jeans nicely together. Given the way a pair of jeans is constructed (tapered), top and bottom sides will be slightly off; make sure your top sides are lined, then cut an also straight bottom seam. 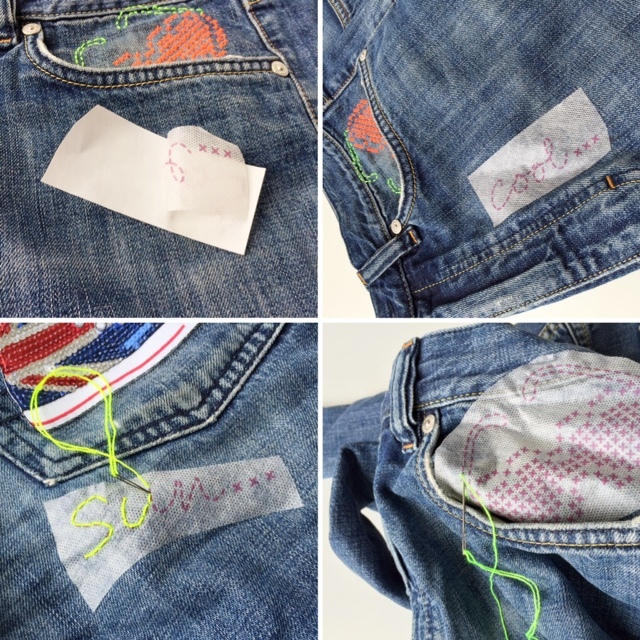 Pin the bottom piece in your bag, sew everything together. 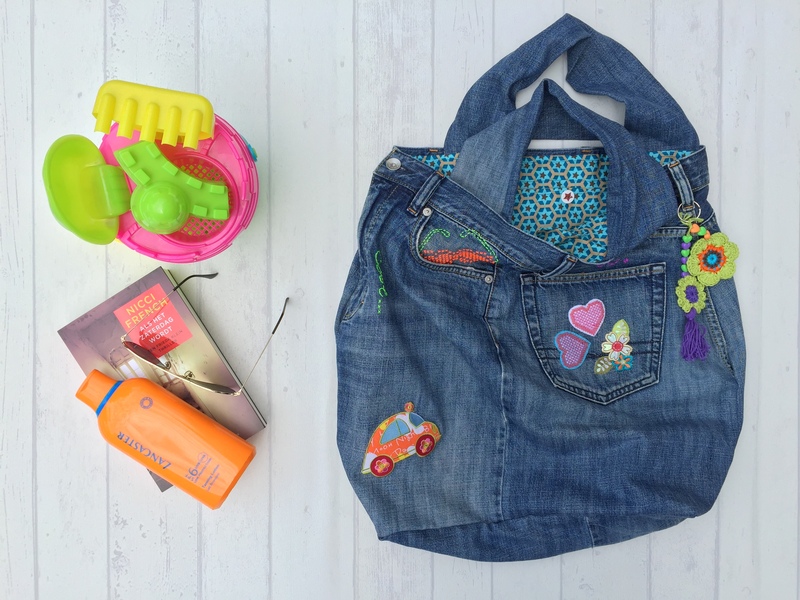 This is the time to start decorating your bag; especially when you’re using ready-made fabric applications, this will be done in a jiffy! I also had great fun with the “Custom by Me” cross stitch package by DMC; just cut out the image you want on your bag, stick it to where you want it to be, (cross) stitch over the already printed pattern, soak in lukewarm water (the DMC-fabric will magically disappear! ), and you’re done! 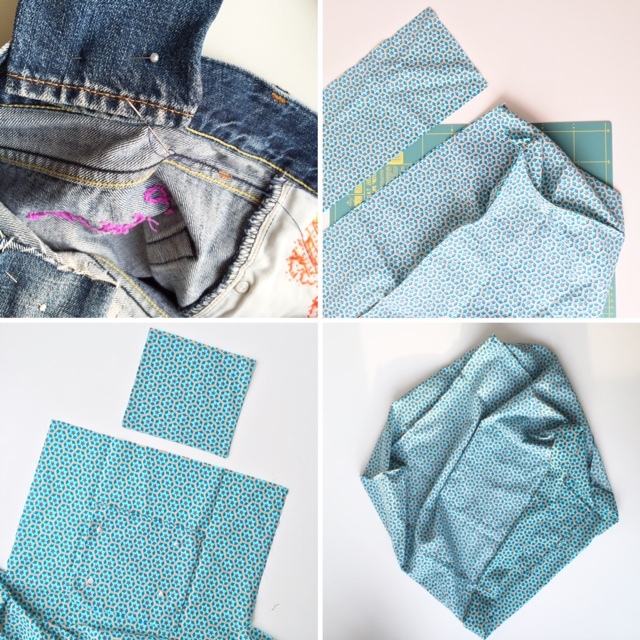 Note: given the fact that you’re stitching on the relatively sturdy jeans fabric, you’ll need a bit of power to get your needle through both the jeans and the pattern, but the result is worth every bit! I loved it! I also added two forgotten little crochet flowers and some beads to my bag, and when all the stitching and decorating was done, I finished the sewing part of the bag. 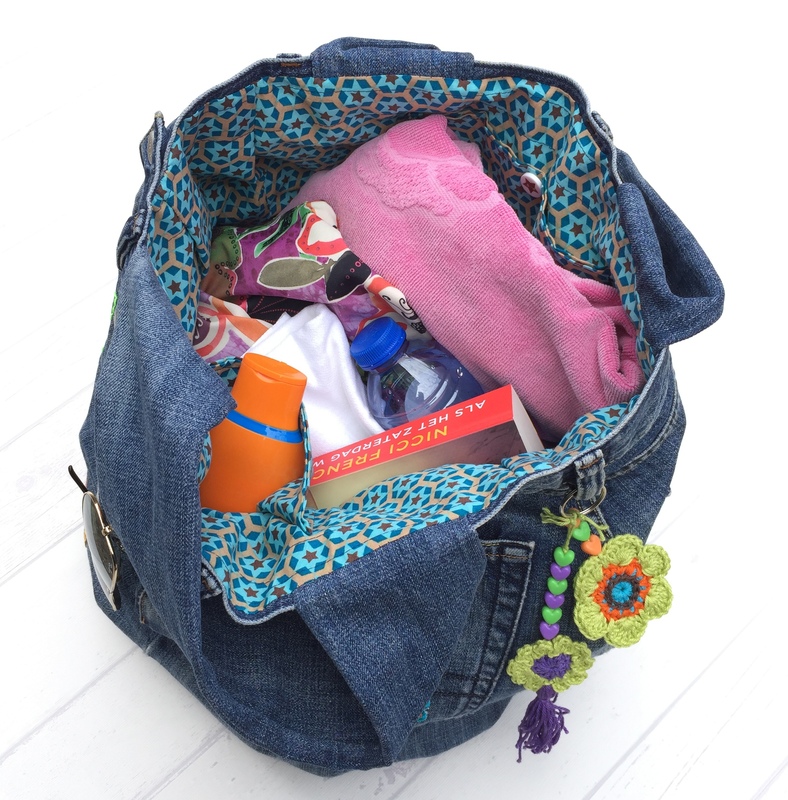 I sewed my handles – by hand – on the inside of the bag, making sure they were firmly attached. I then machine sewed my lining together, following the measurements/size of my jeans bag, cutting out two big pieces (front and back), and two side pieces. 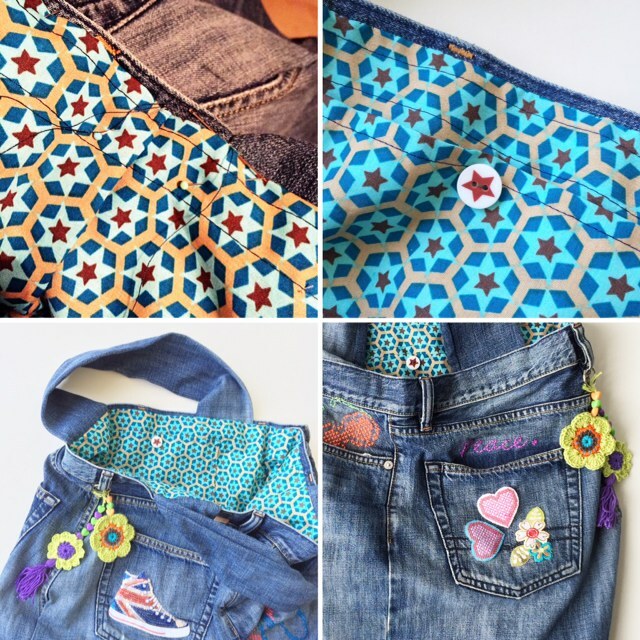 At this point I decided to add two pockets on the inside as well, sewed the lining together, seamed the top part and – without turning it inside out – simply shoved it into the jeans bag. Next I hand sewed my lining into the bag. Since the jeans bag was a bit smaller (remember, the tapered shape) at the top, I took care of the extra space on the top of the lining, by sewing 4 little folds on each of the seams. Final touches were two matching buttons, that went on the pockets, and ta-dah: my beach bag was ready. And you know what? It’s a favorite already, and does a real good job in day-to-day non-beach life as well!